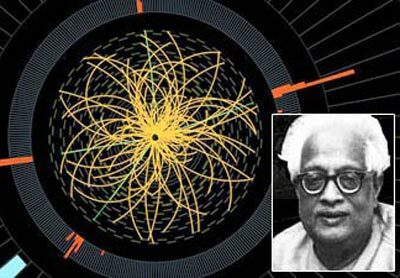 The discovery of a new subatomic particle, possibly the Higgs boson considered “a key to the cosmic riddle”, has put the spotlight once again on Satyendra Nath Bose,the Indian scientist from whose surname the word ‘boson’ is derived. Satyendranath Bose was born on the first of January 1894 in Calcutta. Satyendranath was the eldest of his seven children; the rest were all daughters. His father Surendranath was employed in the Engineering Department of the East India Railway. He later set up his own chemical and pharmaceutical company. Though Surendranath Bose lost his wife at an early age, without losing heart, he brought up all his children well. Satyendranath Bose’s mother, Amodini Devi, had received little formal education but she skilfully brought up her large family of seven children. His primary education began in the local English language school established by the British during the colonial period in India. When the British decided to divide the province of Bengal into two administrative units in 1907, his father transferred Bose to a Bengali-language secondary school. There he was encouraged in his interest in science by his headmaster and his mathematics teacher. An early influence was his physics teacher Jagadischandra Bose. Satyendranath moved to the Hindu School in 1907. It was here that his interest in mathematics and science began, and as is so often the case, it was due to an outstanding mathematics teacher coupled with encouragement from the headmaster. As a student of the Hindu High School in Calcutta he established a new record, scoring 110 marks for a maximum of 100 in mathematics. He had solved some problems in mathematics by more than one method. That was why his teacher gave him more marks than the maximum. Zeal for work and eagerness to learn new things had taken root in him even in his childhood. Young Satyen loved to improvise apparatus for his experiments. At school, in collaboration with his fellow students, he constructed a telescope and other scientific instruments. Bose later attended Presidency College, also in Calcutta, earning the highest marks at each institution while fellow student Meghnad Saha came second. At Presidency College, he met great scientists like Jagdish Chandra Bose and Prafulla Chandra Roy, who inspired him to take up a career in scientific research. At the age of nineteen, Bose became a graduate. On the 5th of May 1914, at the age of twenty, In 1920, he completed his post graduation, getting the M.Sc. degree. Bose’s first important contribution in theoretical physics was a joint research paper with saha. The paper titled “on the influence of the finite volume of molecules on the equation of state”, was published in the philosophical magazine in 1918. The next year bose published two papers in the bulletin of the calcutta mathematical society. One was on “the stress equation of equilibrium” and the other “on horpolhod”. Both these papers were on pure mathematics. In 1920 he again published a joint paper with saha on the equation of state in the philosophical magazine. This was followed by bose’s paper “on the deduction of rydberg’s law from the quantum theory of spectral emission” in 1920. This was also published in philosophical magazine. Then there was no publication from bose for three years. Along with Saha, Bose prepared the first book in English based on German & French translations of original papers on Einstein’s special and general relativity in 1919. Between 1918 and 1956, Bose published only twenty-six original scientific papers, most of which dealt with mathematical statistics, electromagnetic properties of the ionosphere, x-ray crystallography, thermoluminescence, and the unified field theory. While presenting a lecture at the University of Dhaka on the theory of radiation and the ultraviolet catastrophe, Bose intended to show his students that the contemporary theory was inadequate, because it predicted results not in accordance with experimental results. During this lecture, Bose committed an error in applying the theory, which unexpectedly gave a prediction that agreed with the experiment (he later adapted this lecture into a short article called Planck’s Law and the Hypothesis of Light Quanta). The derivation of Planck’s formula had not been to Planck’s satisfaction, and Einstein too was unhappy with it. Bose was able to derive the formula for radiation from Boltzmann’s statistics. The paper, and his method of deriving Planck’s radiation formula, was enthusiastically endorsed by Einstein who saw at once that Bose had removed a major objection against light quanta.This paper was only four pages long but it was highly significant. This little article brought about a great change in the life of Satyendranath. Bose sent his paper to the philosophical magazine but to his disappointment this time his paper was turned down. Under these circumstances, Bose re-sent the paper to Albert Einstein in June 1924, with a fervent appeal for his perusal and opinion. “Though a complete stranger to you, I do not feel any hesitation in making such a request,” he wrote. Einstein immediately recognised the significance of this paper. This paper was going to substantiate and revolutionise his theory of photoelectric effect. Einstein himself translated Bose’s paper into German and sent it to Zeitschrift für Physik with his endorsement for publication. With his demigod status, Einstein’s words carried much weight. It was promptly published, and immediately Bose shot into prominence. Einstein extended Bose’s treatment to material particles whose number is conserved and published several papers on this extension. Bose’s “error” is now called Bose–Einstein statistics. This result derived by Bose laid the foundation of quantum statistics, as acknowledged by Einstein and Dirac.S. 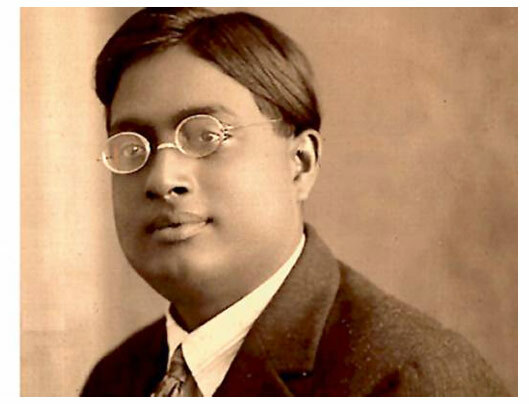 N. Bose’s work on particle statistics (c. 1922), which clarified the behaviour of photons (the particles of light in an enclosure) and opened the door to new ideas on statistics of Microsystems that obey the rules of quantum theory, was one of the top ten achievements of 20th century Indian science. His work was wholeheartedly supported and appreciated by the leading lights in quantum theory, such as Louise de Broglie, Erwin Schroedinger, Paul Dirac and Heisenburg. In honour of Bose’ Paul Dirac coined the word ‘Boson’ for those particles which obey Bose’s statistics. In atomic theory, only Fermions (named after Enrico Fermi) and Bosons were named after physicists. What a wonderful distinction conferred on our great scientist. One kind of boson is the Higgs boson. It is described by physicists in theory, but none has ever seen one yet. The ‘boson’ in the Higgs boson particle, whose search and ultimate detection was one of the longest and most expensive in the history of science, owes its name to Bose. Now Dacca University opened its eyes and recognized the worth of Bose. At that time he had only a Master’s Degree in Science and had no higher academic qualification. Yet the University readily gave him the money for a tour of Europe. Bose first visited Paris in 1924. He stayed there for a year. He conducted research in the Madame Curie Laboratory, which had special facilities. Here he became acquainted with several physicists. The next year, he left Paris for Berlin to join Einstein and work with him. In 1926, Satyendranath Bose was appointed Professor and Head of the Department of Physics., he taught physics to the postgraduate students in Bengali.He was named Khaira professor of physics at Calcutta University in 1945. His students considered him an inspiring teacher and his ability to deliver lectures without notes was legendary. This was a skill he developed as a young man because of his poor vision. Bose was president of the National Institute of Sciences of India in 1949-1950. He also founded the Science Association of Bengali in 1948. This organization was dedicated to popularizing science in his native language. Bose served in the upper house of the Indian parliament from 1952 to 1958. He received the Padma Vibhushan In 1958 he was elected fellow of the British Royal Society. In 1959, he was appointed as the National Professor, the highest honor in the country for a scholar, which he held for 15 years. In 1986 S.N. Bose National Centre for Basic Sciences was established by Government of India, in Calcutta in honour of this world renowned Indian scientist. Bose was a great populariser of science. He strongly felt that it was duty to present science to the common man in his own language. For popularizing science Bose wrote in Bengali. This is the reason why his contribution in popularizing science is not known outside Bengal. Jagadishchandra Bose was born on the 30th of November 1858 in Faridpur in Dacca District. Faridpur was a part of India until 1947; now it is in Bangla Desh. His mother Abala Bose was a tenderhearted and affectionate woman. His father Bhagawanchandra Bose was a man of excellent qualities. As long back as a hundred year ago, Bhagawanchandra Bose started schools in which children were taught in Bengali. Jagadishchandra also received his early education in this school. Jagadish mixed with the poor boys freely and played with them; so he gained first hand knowledge of the sufferings of poor people. There was another interesting person in his early life. This was a servant who used to take Jagadishchandra to school every day. He had been a dacoit in the past. Bhagawanchandra Bose as a judge had sent him to prison. After some time the dacoit came out of prison. But how was he to live? Bhagawanchandra Bose was a very good-natured man. So he employed him as a servant. The dacoit used to tell little Jagadishchandra. events of his past life the robberies he had committed and his cruel deeds. His adventures made a lasting impression on the boy. Young Bose was all curiosity. He wanted to know about everything that happened around him. What is, a glow-warm? Is it fire or spark? Why does the wind blow? Why does the water flow? He was always ready with a string of questions. His father would answer as many questions as he could. But he never tried to impress upon his son that he knew everything. If he could not answer a question, he would frankly tell his son so. Thus Jagadish chandra’s parents took great interest not only in his studies but also in everything that shaped his character. Jagadishchandra began a new chapter in his life at the age of nine. He had to leave his hometown. He went to the big city of Calcutta for further education. He was admitted to Saint Xavier School there. While he was studying at Saint Xavier’s, Jagadishchandra was staying in a boarding house. He had no friends and was lonely here. But he was a born scientist. Even as a boy he had many hobbles which showed his scientific interest. He used to breed frogs and fishes in a pond nearby. He would pull out a germinating plant and observe its root system. He had also a number of pets like rabbits, squirrels and non-poisonous snakes. Even in Calcutta he continued these hobbies to get over his solitude. He grew flower-bearing plants and had animals and birds as pets. He did well in his studies and was in the forefront. The teachers liked him for his intelligence. Jagadishchandra passed the School Final Examination in the First Class. He joined the B.A. class in the college. In those days, science subjects formed a part of this course. He was most interested in Biology (the science of life). But Father Lafont, a famous Professor of Physics, inspired in Bose a great interest in the science of Physics and Bose became his favourite student. Even so, Bose was always interested in any branch of science. Botany, the science of plants, still attracted him much. By nineteen, Jagadishchandra was a Bachelor of Arts. He wanted to go to England for higher studies. Finally, his good mother allowed him to go. She had saved some money. She also wanted to sell her jewels to meet the expenses of her son’s voyage. Bhagawan chandra Bose prevented her and he managed to find the money on his own. At last Jagadish was on his way to England. The year was 1880. Twenty- two-year-old Jagadishchandra Bose stepped into the ship; he was stepping into a new phase of life which laid the foundations of a brilliant future. In London he first studied medicine. But he repeatedly fell ill. So he had to discontinue the course. He then studied Natural Science in Christ Church College, Cambridge. It was necessary to learn Latin in order to study Natural Science; Jagadish had already learnt it. He passed the Tripos Examination with distinction. In addition to the Cambridge Tripos Examination, he passed the Bachelor of Science Examination of London University also. Jagadishchandra Bose was back in India. He joined the staff of the Presidency College, Calcutta. There was a peculiar practice in that college. The Indian teachers in the college were paid one third of what the British teachers were paid! So Jagadishchandra Bose refused his salary but worked for three years. This did not continue for long. His deep knowledge zest for work and cultured behavior won over those in charge of the college. They saw to it that he was given the full salary of the post and not one-third. Teaching the same lessons year in and year out was very tedious to Bose. His was an alert mind, always on the look out for new ideas. He wanted to do research, to widen his knowledge and discover new things. A laboratory is necessary for research. Many scientific instruments are required. Jagadishchandra Bose had no laboratory and he did not have the instruments. But he was not disheartened. For eight or ten years he spent as little out of his salary as possible, lived a very strict life, saved money and bought a laboratory! Generally Marconi’s name is associated with the invention of wireless. (This made possible the use of the radio.) Jagadish chandra Bose had also conducted independent research in the same field. Marconi was able to announce the result of his work and show how wireless telegraphy worked, earlier than Jagadishchandra Bose. So he is called ‘the father of the radio’. In the year 1896 Bose wrote a research article on electro-magnetic waves. This impressed the Royal Society of England (which is famous all over the world). He was honoured with the Degree of Doctor of Science. Bose became famous in the world of science. In India and in other countries there was a strong belief that only Westerners could achieve anything worthwhile in science. Bose proved this wrong concept. He showed that there were geniuses elsewhere too. He visited England again, this time to explain his discoveries to the scientists of the West. Bose needed scientific equipment. But the instruments he needed were not available. But this did not hamper his work. Early in his life he had learnt to make his equipment with his own hands. The scientific instruments he took to England were those he himself had made. After he lectured at the Royal Society, scientific associations in many other countries invited Jagadishchandra Bose. He visited France, Germany, America and Japan besides England. He lectured at several places and explained his discoveries. When electricity passes through a man, animal or plant, we say there is a ‘shock’. When it is passed through a living being the being gets excited, ‘irritated’. Bose developed an instrument that would show such a reaction of the organism on a graph. When electricity was passed through zinc, a non-living substance, a similar graph was obtained. So he came to the conclusion that living and non-living things were very similar in certain reactions. In Paris he gave a lecture on this similarity between the living and the non-living world. Have you heard of ‘radar`? This is a very wonderful scientific device. Sailors on the sea use it; it is also used to get information about aeroplanes coming towards a place. So you see how useful it is during a war. If the aeroplanes of the enemy try to attack a city, the radar shows their movement. J.C. Bose worked out some details of very great importance; these are being used in the working of the radar. When Jagadish chandra Bose again visited England, Cambridge University honoured him as a Professor. Generally, when a man invents something new he declares that nobody can make use of it without his permission. If anybody desires to, make use of it, he will have to pay him money, Why? Because the inventor has worked hard and he has used his time and brains for his invention. It is not right to make use of his work without paying him. An inventor can make lakhs of rupees by just one or two inventions. Bose had invented many instruments. They have since been used by many industries. When he was offered money for these he did not accept it. He was very generous and noble; he felt that knowledge was not any one’s personal property. He permitted any one the use of the fruits of his work. When an outside stimulus is applied to the muscles of a man or a non-living thing (says a mineral), they respond to it. Bose wondered whether this could happen in a plant also. To test this he brought a leaf, a carrot and a turnip from the garden. He applied the stimulus, i.e., and electricity. It was confirmed that plants also respond in a similar way. Jagadishchandra Bose explained this at a meeting of the Royal Society. When anything new is discovered, there will always be people who question it. The results of Bose’s work, too, were not accepted by all. There were people who challenged them and even said that there was not much truth in them. Bose gave a lecture at the Linnean Society next year to a gathering of scientists. He explained with suitable experiments how plants respond to stimuli. Even those who had challenged him could not find fault with his experiments or conclusions. There is an interesting story about a demonstration that Bose gave in England. On that day he wanted to show some new things that he had found out. He had come to the conclusion that plants can feel pain like animals; that when we pinch them they suffer; and that they die in a few minutes after they are poisoned. Bose wanted to show experiments to prove these conclusions. A number of scientists and other leading men and women had gathered to hear him. Bose started the experiments by injecting poison into a plant. The plant should have shown signs of death in a few minutes. On the contrary, nothing happened. The learned audience started laughing. Even at this adverse moment Bose showed admirable calmness. He thought quickly. The poison that he injected into the plant did not kill it. So, he supposed that it would not hurt him also. With full confidence he got ready to inject the poison into himself. At that instant a man got up and confessed that instead of poison he had put similar colored water. Now, Bose conducted the experiment again with real poison, whereupon the plant withered and died as expected. Jagadishchandra Bose continued his work and made new discoveries. He found that plants shrink a little during the night. He found out why plants always grow towards light even if they have to bend. He also found out the reason why some plants grow straight and some do not. He explained that this was due to the ‘pulsation’ in plants. This pulsation quickens by heat and slows down by cold in plants. Jagadishchandra Bose did remarkable work, – and scientists outside India had honoured him. Yet there were people who opposed him. As a result even the Royal Society delayed publishing his valuable work in its publications, But nothing could make him give up his work. He was sure that years of research had led him to the truth. So he did not feel that it was very necessary to depend on scientific journals only. He wrote books and published them on his own. Nature had always been a source of attraction right from his early age to Bose. There are flowers on plants; flowers give fruits; the leaves fall off; seeds germinate into new plants – we see all these around us. But Bose was interested in these happenings, which to many people seem quite ordinary. He asked others questions; he asked himself, too: ‘How do these things happen?’ Not always could he satisfy his curiosity. But it was his way to try to find answers to any questions arising in his mind. Jagadishchandra Bose was famous as a scientist. He brought laurels to his motherland. But his interests were many-sided. He was especially interested in literature and fine arts. The great poet Rabindranath Tagore and Jagadish chandra Bose were very good friends. The first time Tagore visited Bose, he was not at home. Tagore left a bunch of champak flowers. This was the beginning of their friendship. Tagore invited Bose to stay with him for some time. Bose agreed to do so on one condition. The condition was that Tagore should narrate a story to him every day. This is how a number of Tagore’s stories came to be written. Have you read the story ‘The Cabuliwallah’? It is very fine story; it narrates how a deep and strange friendship grew up between a rough pathan and a tine Bengali girl. This has been translated into several languages and is well known in a number of countries. Tagore wrote this story when Bose was staying with him. Jagadishchandra Bose died in November 1937. To the very end he was busy with research. Wealth and power never attracted Jagadishchandra Bose. He toiled for science like a saint, selflessly. This great scientist is a great example to all.